The weather is somewhat unpredictable at present making it incredibly difficult to decide what to wear each day! The sun seems to make an appearance but as soon as you slip into a vest top and cropped trousers the rain arrives and you require a jumper and wellies instead. 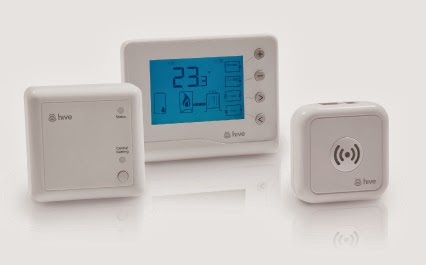 Hive allows you to control and alter both your hot water and heating while on the move. With a simple touch of a button via your mobile (laptop or tablet) you can adjust the temperatures and schedules set so when you arrive home you can be snug as a bug or nice and cool, whichever you prefer. It's ideal for after a long day at work when you want to boost the water for an hour to relax in the bath, when you decide to head out for a meal or drinks last minute and don't want to heat an empty home or when you are so comfy on the sofa and just can't be bothered to get up (or is that just me?!). It's a really handy thing to have especially with alert options available too which keep you updated when temperature levels are reached. Furthermore, you can save £150 each year when you have Hive Active Heating installed in your home and there is no need to change your energy supplier - bonus! Keep hold of those toilet rolls and containers to make space rockets and robots on rainy days. It saves on purchasing craft materials and keeps kids happy. This clever invention has an initial set up cost of just £199 which includes full installation, a state of the art wireless thermostat, receiver and hub. It's the little things like this that in the long run save so much money for your family it's definitely worth investing in. The wireless receiver is connected to your boiler, the hub is connected to your broadband router and the thermostat IS connected to the wall all in around 90 minutes. You can then set up your account online and use the app too for full control when you are out and about. Is Hive heating your home yet?